Noble words spoken to a focused audience. 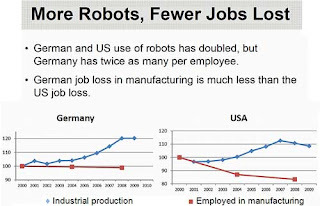 But there is much confusion about why manufacturing is important, and even more confusion as to how robots – which displace workers – are necessary for America to retain it’s competitive edge and manufacturing prowess. The confusion and obfuscation from politicians has been constantly in the news. Since 2008, when President Bush approved a $17.4 billion auto bailout, the first of many loans that trailed into the Obama Administration, pundits and politicians have derided it, ridiculed it, and Mitt Romney mildly labeled it as “[the] wrong way to go” (without ever suggesting the right way). 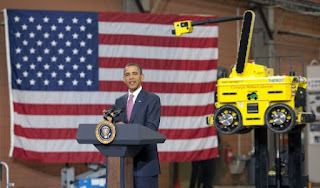 Other headlines exclaim that robot sales in 2011 exceeded all expectations and that investment in robot installations surged globally in 2011 to 150,000 units sold – a year-over-year growth of 30%. According to WANTED Analytics, a real-time talent analytics site, there were over 2,100 U.S. job ads for robotics skills in January, 2012, a 44% year-over-year growth rate from 2011. What are the figures for robotics? What happens when a robot is deployed in a factory? by Mike Wilson, Chairman of the British Automation & Robotics Assoc. In a recent study commissioned by the International Federation of Robotics, the ratio for job creation was determined to be 3.6 for every robot deployed. 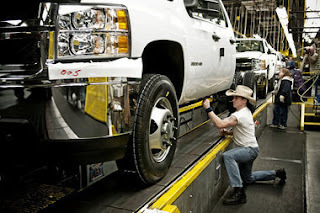 The IFR Metra Martech study showed that 300,000 workers are directly involved in the manufacture and operation of robots and an additional 3 million jobs were created in factories where accuracy and consistency could not be achieved without robots; and another 300,000 jobs were created where poor working conditions were overcome by the use of robots — 3.6 million total. Most of these workers are in the electronics (1.2 million) and automotive (1.5 million) industries. Thus the Metra Martech study is suggesting a ratio of 3.6:1 based on the 1.15 million industrial robots presently at work around the world. Investors and risk takers who want a fair and stable return on their investment. Those who make the robots want to work in a thriving industry with lively peers, good benefits and the promise of job stability. Workers that make the components and ancillary products or provide engineering and integration. Factory owners, by deploying robots, want to reduce waste, maximize resources, provide a better and safer workplace for their workers, and maximize efficiency and productivity to stay competitive in the global marketplace. 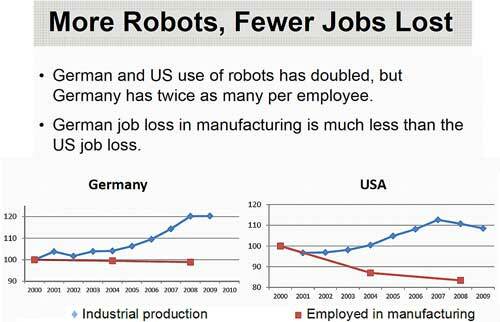 Factory workers who, through the use of robotics, no longer need to toil in dull, dirty or dangerous situations. Factory owners also want to keep their factories nearby for control, to foster goodwill, and to be near a willing resource pool in and from the community. Communities surrounding factories where taxes and wages spent not only contribute to the wellbeing of people in the area but also add income to the local governments (in the form of sales, income and property taxes) letting them invest in the infrastructure that makes everything work. A noble sentiment on which to end this article but one that can be achieved if we understand that we are all in this together we are all stakeholders and beneficiaries.